Last week's new recipe for 2013 was DELICIOUS! Unfortunately, I don't have a recipe to share with you because I came up with it all on my own. 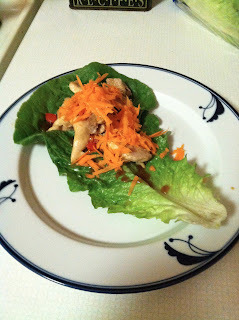 So, let me share with you on how I prepared these amazing Asian Chicken Lettuce Wraps. 1- Cut the chicken into long slices and/or cubes. 2- Season the chicken before putting in the pan with the Chinese Five Spice Blend and some salt and pepper. 3- Cook the chicken in a pan, medium to low heat, in some olive oil with Pam. 4- Cut up the red pepper into cubes and add that to the chicken in the pan. Continue to mix until fully cooked. 5- Shred one carrot stick; and put to the side. 7- Heat up a generous amount of the Sesame Garlic Sauce for about 15-20 seconds. 9- Drizzle the heated Sesame Garlic Sauce onto the lettuce. 10- Once chicken is fully cooked. Place that along with the red peppers onto the lettuce- the top/largest part is best. 12- Next place the carrots on top of the chicken and red peppers. 13- Lastly, squeeze a lime over the ingredients to add a little zing! ...and voila, you have Chicken Asian Lettuce Wraps! All that's left to do, is to fold it up and enjoy! What's great about this meal is that it was super easy and quick to make as well as being easy to add different ingredients to! The options are endless; there are so many different things you can add to it or change, so make it your own! It was healthy, light and very enjoyable! Great to use as an appetizer or a main course. What would you put in your own lettuce wraps? Let me know!